The most commonly fished species of tuna are skipjack, northern bluefin, southern bluefin, albacore, bigeye and yellowfin. Worldwide, tuna stocks are generally fully exploited with many species overfished. 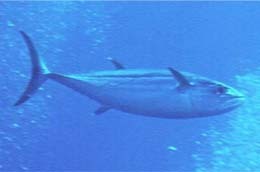 Subsequently, as tuna do not reproduce until they are four years old, youngsters are being caught to make up the catch. Bluefin tuna stocks are at an all time low and southern bluefin stocks are deemed ‘critically endangered’ by the World Conservation Union . Tuna stocks have fallen from 850,000 tonnes in the 1950’s to just 40,000 tonnes today. It was actually hearing about the plight of tuna that led us towards the environmental stance we are adopting now. Owing to the precipitous decline in numbers of bluefin tuna in our seas, Moshi Moshi has now stopped serving it in our restaurants. Sadly this has also resulted in the difficult decision to remove tuna belly (toro) from our menus, a delicacy which is greatly missed. We currently serve yellowfin, but even though yellowfin exist in comparatively larger numbers and are not experiencing the same pressures as bluefin tuna, we are greatly concerned by the overall situation and are closely monitoring the status of this species with a mind to making further changes, if necessary, in the future.